…I bow down to thee. I haven’t been feeling too well since eating that ice cream so we decided to go out for dinner last night. When we first came here, we looked up a falafel place but kind of put off going there, as I found a recipe online, which I’ve made a few times. Yesterday, we finally decided, it was time to go. We first read reviews, since we’ve been disappointed SO many times with the food around here. I live in the area surrounding Disney World…where there are so many places just trying to make a dollar and no one really cares for quality. Usually if we eat out, we go to one of the Disney parks because we know it’s clean and delicious. We were pretty surprised when we read that they had 4 1/2 stars…and the lowest rating they were given was 3 stars, which when you read the review didn’t even sound that bad. For some reason I thought this place was much farther from me. I guess because of the Kissimmee address, I figured it would be a bit of a hike, but it only took about 15 minutes to get there, which is pretty good. PLUS it’s on the way to JoAnn’s!! I read a few times over that it used to be a Quizno’s and it’s very apparent when you walk in. The same set up, tables, chairs, the Q on the glass, etc are still there. They kind of decorated over it. It’s probably their only downfall, and I found it more entertaining than anything else. I had read it was cheap, every review remarked how inexpensive it was to eat there and it was very pleasing to find this, here, in tourist country. 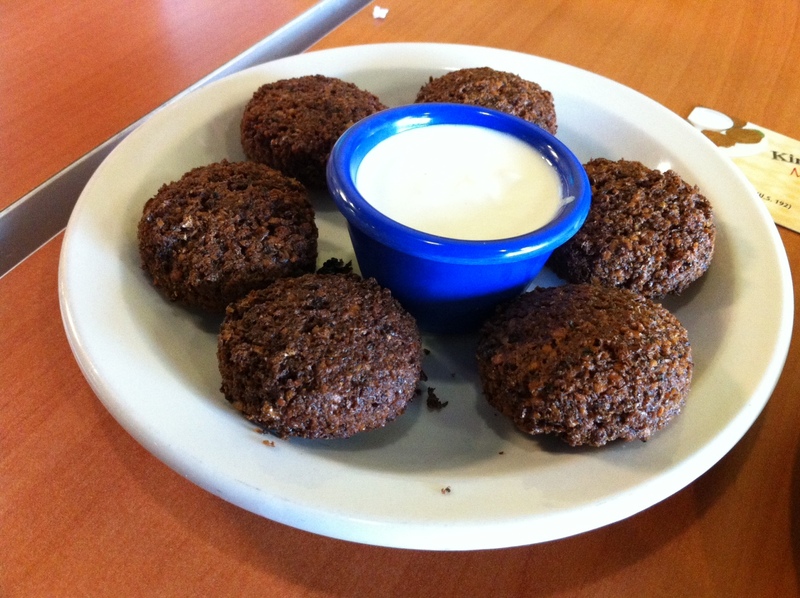 We started with appetizers, 1/2 dozen falafel(also available in dozen) and a small hummus(available also in large). The hummus was so creamy and delicious. They served it with warm fluffy pita and it was delicious and beautifully served. The falafel was amazing. Absolutely amazing. It was perfectly crunchy on the outside and so soft and flavorful on the inside. I am craving more today. I wish my falafel was half as delicious as this!! Next time we go, I can see getting the larger order of this!! 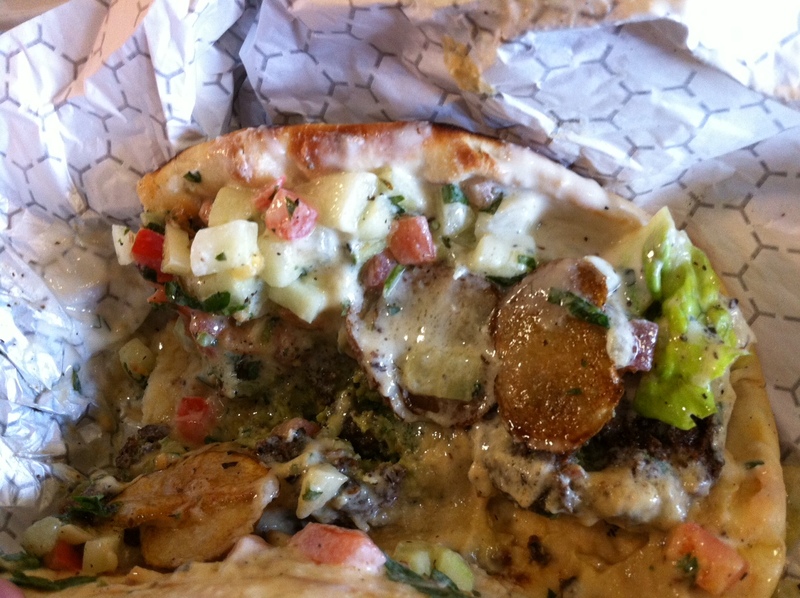 This looks really messy…Falafel on a flat bread with fried potatoes. Mr McDorkin ordered this, as he is in fact addicted to falafel and needs serious help. He actually took his time and ate this. I was proud because I could see the need to unhinge his jaw and jam it down his throat like a python. I ordered the regular gyro, with beef and lamb. Seriously. Amazing. Their bread is so soft, the veggies are perfect, the sauce is amazing and the meat is perfectly spiced. I savored the flavor and I could also eat one of these right now, too. Baby McDorkin was a beast boy, per usual, and he loved up on the falafel and the gyro. But the dessert, which we sadly didn’t get to take any photos of, was his true love. We ordered a pistachio baklava and it was sublime. We had to order another(they are pretty small but only $1.75 each) because he needed more. Then he laid in the booth and we had to talk him into leaving. I think he seriously would have been happy to stay in that restaurant and replace me with their baklava. Which, seriously, was amazing…It wasn’t overly sweetened, like I notice a lot of Greek places make. So, yeah, I want to eat there every day for the rest of my life. We all do. The kicker, the bill, with 2 small appetizers, 2 sandwiches, 2 small desserts and 2 bottles of water was only about $20. Insane, right? They have larger looking platters, vegetarian ones included, that look like they could feed 2 and are about $10 a piece, depending on the platter. It I wasn’t a junkie for gyros, I probably would have gotten one. There is always a NEXT TIME!!!!!!!!!!!!!!!!!!!!! Pretty sure Mr McDorkin has put in a birthday request to go there! 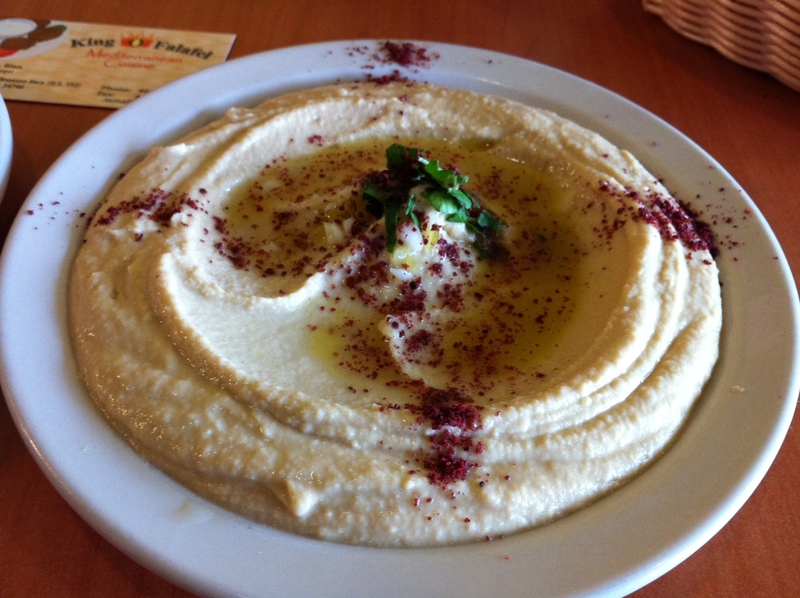 This entry was posted in Food and tagged authentic, disney, falafel, florida, food, gyro, hummus, kissimmee, mediterranean, orlando, restaurant, review, world by themcdorkins. Bookmark the permalink. Thank you for posting this. I live in the suburbs, away from the attractions, but am there often enough. I will definitely have to check this place out!